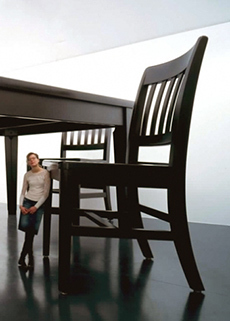 Robert Therrien, Under the Table, 1994. Wood, metal, and enamel. 117 x 312 x 216 in. overall. The Broad Art Foundation, Santa Monica. ©Robert Therrien. Photo ©Douglas M. Parker Studio, Los Angeles. The Museum (namely a few of my colleagues in the Education Department, Fran Serlin and Amy Kirschke) have put together a packed weekend to kick off the holidays and bring together design superstars with Milwaukee artists and companies, November 18–21. First up is Alberto Alessi, an Italian designer whose family company, Alessi, has been around for generations. He’s coming to Milwaukee straight from Italy to kick off the weekend with a lecture on Thursday, November 18, at 6:15 p.m. This is a big deal, so make sure you RSVP at 414-224-3803 so you get a seat! Want to learn more about Alessi? You can see a bunch of his firm’s clever, gorgeous designs in European Design Since 1985 (and you can also take a few home with you from the Museum Store). I’m also excited for MAM After Dark: Under the Table on Friday, November 19, where you can experience Robert Therrien’s 10-foot tall table, among all the usual late-night offerings you’re used to at MAM After Dark. The next day, catch a joint gallery talk with curator Mel Buchanan and Design Within Reach‘s Dana Grabovac, on Saturday at 1:30 p.m. And later, our own Cafe Calatrava’s Chef Thi Cao gives a plating demonstration at 2:00 p.m. for all the foodies out there. I’ve highlighted a few events I’m particularly excited about here, but believe me, there’s something for everyone, so be sure to check out the calendar listing for all the details. Finally, below is a sneak preview of all the installations. (Don’t worry, we’ll have maps on hand during the weekend so you can find your favorites when you get here.) Hope to see you here for this first-ever, huge celebration of design! Anthropologie (Tera Cares, Kim Weiss), Lisa Englander, Samara Studios (Stewart Dempsey, Scott Meier), Williams-Sonoma (Brian Schultz, Jen Bethia), Monches Farm (Matt Kastell, Scott Sieckman), Della Wells, Ray Chi, George Watts & Son Inc. (Dana M. Golubeff), Linda Wervey Vitamas, Garland Alliance, Inc., JoAnna Poehlmann, Victoria Vonier and L. Matthew Trotter, SHARP Literacy, Inc., UWM Jewelry and Metalsmithing Student Organization, Crate & Barrel (Anna Liza Matienzo, Sarah Evrard, Meredith Gauthier), Design Within Reach (Dana Grabovac-Ircink, Kristin Krantz), MIAD (Fahimeh Vahdat), Milwaukee Art Museum Store (Jeanne Tripi, Megan Yanz), Broadway Paper (Kate Strzok, Angelica Vazquez, Kellie Krawczyk), Frankie Flood, Tim Murphy, and Dynamic Events by David Caruso. This entry was posted in Events and tagged Alberto Alessi, Art of the Table, European Design Since 1985. Bookmark the permalink.